Thus Sang by the legendary Bhupen Hazarika;-A prophet for Assamese music lovers around the world. It all sprang out from a conversation I was having with my wife and dawned on me that our ladies back home, in the rural parts of the northeastern state of Assam are so competent while going about their daily lives. Oblivious they may be, of what is happening in the world, may not have heard about re-election of Barak Obama or Mitt Romney’s name in the first place, but they are no less capable than their counter parts in any part of the world. 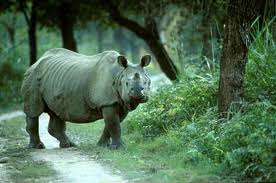 One-horned rhinoceros_only found in Kaziranga National Park in Assam. It is an endangered species and the whole world is for the protection of it. Right from spinning their yarn to weaving their own fabric, the rural women from Assam often exhibit their dexterity in whatever they accomplish in the daily chores around the household. 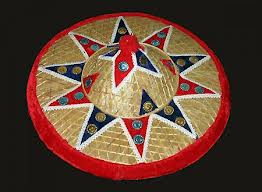 Despite having seen that since birth, my grandmother passing on that tradition (weaving) to my mother and aunts, it never occurred to me that it is indeed a tradition that is worth a million accolades. They are not dependent on cloth mills or merchants for their fabric. It is all there at their fingertips. The traditional gamocha (towel_ga=body; mocha=to rub), the makhela, the sadar (saree-the six yard wonder), the arichadar and many more, they weave everything a person would need to drape himself/herself. They do not vie for a place in the international fashion designers’ list but each one of them is a designer in their own right. A Lela Rose, a Donna Karan or our very own desi Ritu Kumar, these rural Assamese women are also worth their salt, when it comes to designing traditional clothing of the region. A zillion salutes to them!!! 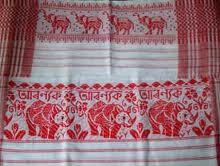 It is a different issue, that we no longer don these traditional clothes but only the modern exports from the west. But still, that does not disparage the skills of these unsung rural women from Assam.